There are big books, and then there are books that are big before they're even released, and Emma Healey's Elizabeth is Missing is one of the latter. Bought by Viking in a hotly contested auction (I met one of the unsuccessful bidders recently, who more than a year on is still sad they didn't win), I haven't heard one bad thing about Elizabeth is Missing from anyone who's read it. Maud, 82, is getting forgetful. Living alone, the only people she regularly encounters are her carer, and her daughter, Helen. Even then, she sometimes forgets who they are, or what they're doing. And she always forgets that she's made herself a cup of tea, and is constantly puzzled about the rows of cold tea at the bottom of her stairs. Maud does know one thing though, and that is that her friend Elizabeth is missing. No one else will believe her, but Maud's investigations, written on countless pieces of paper, means she knows Elizabeth is definitely missing. But how will Maud find Elizabeth? I wasn't sure at first how I'd warm to an 82-year-old narrator with whom I had nothing in common, but Healey has created Maud with such a wonderful voice that I found myself immediately drawn in. Maud is an unreliable narrator, but not a classic one - she's not unreliable because she's hiding things from other characters or from the reader, but because her brain is letting her down in some respects. Maud's repetition of things she's forgotten but we know could be annoying, but instead Healey uses that repetition to add layers to the novel, subtly building up the evidence which, if only we were clever enough, would help us to solve the mysteries within (all those objects, all those clues). Maud wants nothing more than to get to the truth, and her struggle to get there is both fascinating and sad. Talking of sad, I found my heart twisting slightly every time Maud's condition worsened. Healey injects some humour in to the novel, with Maud's obsession with tea and peaches, but Elizabeth is Missing is also a portrait of someone who is losing their memory, and of the ways in which that affects them and the people around them. For Maud, I felt sad because she so clearly was able to understand at times what was happening, and then at other times was so lost. For Helen, I was sad because she was losing her mother, while not physically losing her. At times, I was frustrated at Helen for not acting more to help her mother, but it's clear through the glimpses we get of her that Helen is finding it difficult to come to terms with the changes dementia has wrought in Maud, and when she does finally act it's with consequences that rapidly help solve the central conceits of the novel. 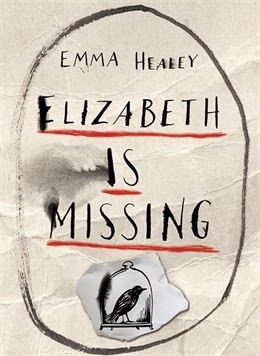 Obviously, the title of the novel shows the focus is on finding Elizabeth, but Healey weaves in a secondary narrative which is as intriguing, if not more, than that of the present day. While Maud is unable to remember parts of her day-to-day life in the present, she has a perfect memory of her younger years, and particularly of the time her sister Sukey went missing, never to be seen again. Here, Healey paints a picture of a post-war family, adjusting to life in peacetime, travelling the line between nostalgia and modernity, while also presenting a second mystery. Maud may be the unreliable narrator, but with the missing Elizabeth and the missing Sukey, it is all the other characters who are untrustworthy. Wonderfully, Healey crafts her story in such a way that at one time or another I suspected that just about every major character was involved in one or other of the disappearances. While I did solve one mystery pretty much perfectly, the surprise twists in the last quarter of the book were things I never saw coming. They were so cleverly done, and fit so well, that had Healey been in the room while I was reading, I'd have given her a standing ovation. Elizabeth is Missing has been nicknamed Gone Gran. As much as I love Gone Girl, which reinvented the unreliable narrator/domestic thriller genre, I think Elizabeth is Missing is a more sophisticated book, because it reinvents the genre again. It's stunningly written, and will give you palpitations, and it's worth every penny (and I believe there were a lot of them) that Viking stumped up for it. How I got this book: From the publisher, Viking. This did not affect my review.